Alas, poor Richard. I had high hopes for him. When Richard Ojeda came on the scene, as a trash-talking pro-labor West Virginia Democrat, he seemed like the sort of refreshingly aggressive and uncompromising figure that the party could really use. He supported Bernie Sanders, he spoke in plain and accessible terms about the lives of the working poor and the opioid crisis, he’s a veteran, and he refused corporate money in favor of donations from individuals and labor unions. All good. And even though Ojeda had voted for Donald Trump, he seemed to regret it. Everyone makes the occasional catastrophic error of judgment. If Ojeda had finally seen through Trump’s phony populism, and committed himself to working for the “real thing,” then good for him. When he ran for Congress after serving in the state senate, I hoped he would win. Ojeda did not win, and it was not close. Republican Carol Miller beat Ojeda 56-43. Ojeda’s performance was good considering that Donald Trump had won the district in 2016 by nearly 50 points. (Note, though, that the district had also been represented in Congress by a Democrat for 30 years until 2014, so it wasn’t completely impossible to imagine that Ojeda could win.) Immediately after Ojeda’s loss, however, he did something so bad that I don’t think anyone should trust him for a long time to come: He announced he was running for President of the United States. Now, usually you run for President after you’ve won a lower office rather than lost it. If the members of Ojeda’s district didn’t think he ought to serve as their representative, it’s hard to see how he will convince the rest of the nation. It’s also a truly disappointing move on Ojeda’s part. Previously, it was unclear whether his flamboyant personal style was just sincere passion or whether it was attention-seeking schtick. The run for president strongly suggests the latter. Of course, there’s no way in hell that Democrats should nominate Ojeda. Some may be tempted by the idea that we need to “win back the white working class,” and think Ojeda’s West Virginia accent will do the trick. But nobody who voted for Donald Trump in 2016 is fit to oppose him in 2020. This is, first, because that person showed a very serious lapse in judgment very recently in their career, and if you vote for a vile, bigoted plutocrat like Trump, you have a high burden of proof to show that you’re perceptive enough to lead the entire country. I do think people are redeemable, but 2016 was not very long ago! Ojeda was not put off by Trump’s dehumanizing rhetoric about immigrants or his documented history of sexual assault. That does not speak well of Ojeda. Nominating Ojeda would also be a very bad idea from a purely practical perspective. In trying to defeat Donald Trump, you do not want to run someone who voted for Donald Trump. “Even my opponent voted for me” is not a good look. Trump approaches politics as a dominance contest, and having given him your vote is a devastating show of weakness. Trump would exploit the hell out of it. Running a Trump voter against Trump himself would also not be the way to draw clear contrasts between the Democrats and the Republicans. Ojeda’s pro-life stance would not appeal to Democratic women, and his previous Trump support would hardly be likely to convince disillusioned black voters to start turning out again for the party. I say “alas,” though, because I really did hope Ojeda could build a national political profile… eventually, through hard work and commitment. He seemed like the sort of person who could help rebuild the Democratic party’s fortunes in West Virginia. Granted, he had lost this race, but the margin was respectable, and he could spend the next couple of years organizing people and fighting for the interests of working West Virginians. If he proved himself to them, if he showed that he was in it for them and not just in it for media attention, then he would earn respect. Ojeda was important in the West Viriginia teacher’s strike, so he should spend more time helping rebuild labor power in his home state. But this isn’t what he did. 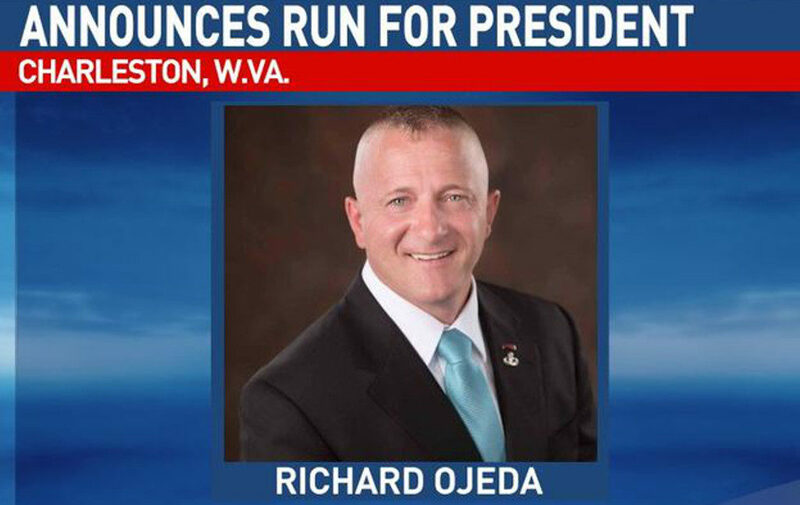 I am not saying Richard Ojeda is “unqualified” to be president—I think qualifications are often overrated and I’d happily vote for anyone I thought would be good at the job no matter what their background. However, I do think you need to prove to the public that you’re trustworthy and not just enjoying the media attention. Others have pointed out how strange it is that white men who lost their races this year (Ojeda, Beto O’Rourke) are being talked about as presidential candidates, while candidates of color who lost (Stacey Abrams, Andrew Gillum) are not. I do think it’s strange, and telling. Surely the whole idea of running O’Rourke or Ojeda would be that they’ve shown they can win their home states. I’ve already made my position on 2020 clear: I think Democrats have only one clear option, Bernie Sanders. This is not because I’m fanatically committed to Sanders personally, but because I simply don’t see any other candidates who have his kind of progressive track record and can effectively challenge Donald Trump. Every other potential nominee is fatally flawed for me in one way or another—either they’re quite new to embracing left ideas, and therefore cannot be trusted to reliably fight for them, or they have political liabilities against Donald Trump (see, e.g., Elizabeth Warren’s disastrous response to the whole Native American issue). I am still open to the possibility that some new face will emerge. If they do, however, they need to meet some simple mandatory criteria like “has proven they can win elections in their home state” and “has shown themselves reliably committed to left values over a period of years.” Eventually, Richard Ojeda could have been this person. But he is not that person now, and he will not be in 2020.